Toronto Dogs Directory: Pets & Prozac - Your Thoughts? Pets & Prozac - Your Thoughts? Great news, pet owners: You no longer have to share your Prozac with your hyper pooches. They now have their own beef-flavoured pet Prozac. No yip. Besides, pet owners, you've done enough already: you've shared your neuroses with your puppies and pussycats and, more than likely, you're responsible for their perceived unsettled states of mind. Furthermore, you may have no qualms about forking out hard-earned funds to cure what you believe is ailing your Fido. Statistics show that North American pet owners shell out more than $5 billion -and counting -on meds, for everything from dealing with tapeworm to, now more than ever, psychoactive drugs. No surprise, then, that North American pet owners spend more than $53 billion annually on food and supplies for their critters. Or spa services like "pawdicures" and "doga" -that's yoga for their Bowsers, silly. Or that North Americans now pay more for dog-walking services than daycare for their humanoid offspring. That's the nature of the beast these days. There are more than 140 million pet dogs and cats in North America, and their owners can be rather obsessive. These are some of the alarming findings uncovered in Pet Pharm, a must-see documentary -for those with or without animal sidekicks - tonight at 9 p.m. on CBC-TV and tomorrow at 10 p.m. on CBC News Network. Doc director Patrick Reed raises the question of whether putting pets on Prozac and the like is an act of compassion or indulgence. The answer is not as obvious as it may seem. In addition to a slew of anxious pet owners at their homes or on the road at the Woofstock festival in Ontario, Reed speaks to vets on both sides of the controversial position of prescribing psychoactive drugs for pets: Nicholas Dodman and Ian Dunbar. Dodman would be the pill proponent, while Dunbar is all about paws and love without the Prozac buzz. Both make convincing arguments for their respective cases. But the frightening reality is that they are increasingly dealing with alleged grown-ups who view their pets as surrogate children and who have passed their foibles on to them. And so if the pet owners believe they need Prozac or the like to chill out after a draining day, they are sometimes of the opinion that what's good for them is good for their dogs and cats. Not all pet owners come across as nuts here. Take Toronto dog owner Jen Hart. All was swell between her and her rescue hound Zeke. Until Hart hooked up with a new beau, Greg, with whom Zeke took exception. Zeke took a large nip out of Greg. Then Zeke had to be muzzled when in the same room as Greg. Hart tried all sorts of approaches with trainers and vets to find a solution. None worked. She didn't want to have to make a choice between her man and her mutt. So, as a last resort, she put her pet on Prozac. Viewers will have to determine for themselves if the therapy was a success. Viewers will have less difficulty coming to conclusions about whether psychiatric meds are really needed to handle alleged cases of obsessive-compulsive and separation disorders. Unlike Dodman, Dunbar seeks to curb anti-social behaviours by playing with and praising pets. He notes, as is evidenced here, that not all "yuppie puppies" react well to drugs. He also observes that perhaps it's not the unruly pet who has to be changed, but rather the neurotic owner. Dodman, on the other paw, estimates that 4 to 5 million pets a year in North America must be put down because of their bad behaviour and that meds may be the panacea in keeping them alive. If you think North Americans are a little over the top, Reed heads over to Japan, where canines now outnumber kids under 15. He also discovers that there are five-star hotels for pets, that there are kitty cafes where folks can frolic with felines for a price, that there are companies renting out dogs for $30 an hour. And, no surprise, that there are an inordinate number of millionaire Japanese veterinarians. Reed's initial feeling upon learning a few years ago that people were administering beef-flavoured Prozac to their pets was not entirely positive. "My knee-jerk reaction was that this was a sign of the apocalypse," he says in a phone interview from his Toronto office. But Reed, who abandoned a Ph. D. in history to make movies, decided not to jump to quick conclusions when undertaking this doc: "I didn't want to sit in judgment. I started looking more closely at the situation and saw that people were really struggling with their pets and their behavioural issues. They had tried so many different approaches before finally reaching for the pill." Yet he is alarmed about the potential of pet-pharm conglomerates preying on the unsuspecting and naive. "If there is a cautionary tale here, it's to watch out for those pharmaceutical companies. Maybe these pills work in extreme cases, but the pharmaceutical companies are not marketing to niche extreme cases. "It's the classical marketing. Like does your dog whimper when you leave the house or get excited when you come home? Then your dog is probably suffering from separation anxiety, they would like you to think, and is a candidate for a pill. 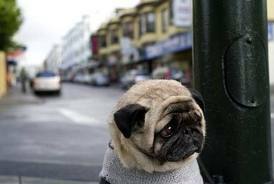 But, honestly, all dogs are a little upset when their owners leave." True enough, based on personal experience with my two pooches. But not enough that either of them need meds to mellow out. Cats becoming despondent when their owners split? Not so much. The usual reaction in my kitty's case: "Here's your coat. What's your hurry?" Reed reports the same with his cat: "If you treat your pet as a pet, there's often no problem. But if your pet fulfills your need for a child, there's a certain degree of transference. Then you can't help but look at the animal through your own eyes, and with more and more people on psychiatric medication ... well, you can see what may happen."